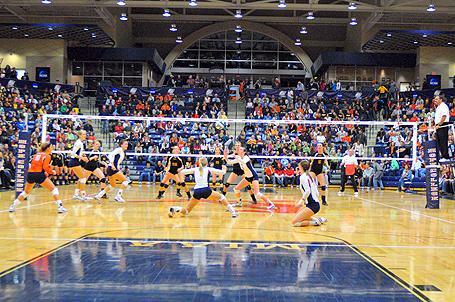 The 2011-12 Hope College volleyball team has been named a recipient of the Team Academic Award by the American Volleyball Coaches Association (AVCA). The award, earned by 90 of the estimated 400 NCAA Division III programs, honors teams that displayed excellence in the classroom by maintaining at least a 3.30 cumulative team grade-point average on a 4.0 scale. This is the fourth consecutive year that Hope has been presented the AVCA recognition. The Flying Dutch, coached by Becky Schmidt, maintained the highest GPA among Hope's 18 athletic teams during the 2011-12 school year, at 3.739. This honor brings to nine the number of Hope athletic teams named to national academic honor rolls in 2011-12, joining men's and women's cross country, men's and women's swimming & diving, women's basketball, men's and women's tennis, and women's golf. Other Michigan Intercollegiate Athletic Association (MIAA) teams presented the 2011-12 award are Calvin, Kalamazoo, and Saint Mary's.